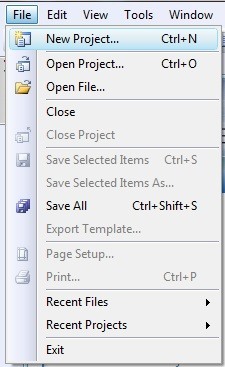 Now, select Windows Forms Application and name it whatever you want. Okay, you've created a new project! In Form1 Properties, select "MaximizeBox" and make it False. Select "Show Icon" and make it false, too. Now, let's go to the code part. user32 is for x32 computers - change to user64 to x64 computers. Okay guys! This is the last part before debug the project. Double click on Form1. In top (but under the tabs), you will see a bolt. You're done your Auto-Clicker! Just press F5 (or click in the green arrow) for debug. 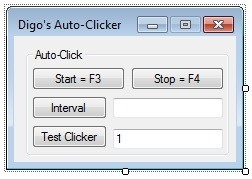 Put an interval (1 is the fastest speed; 1000 = 1 click per second), hover mouse in "Test Click" and press F3 to start. Works? Okay, now press F4 to stop. Now, just share with your friends and be happy! this is not work on visual studio 2012 .Need little tweaking .. 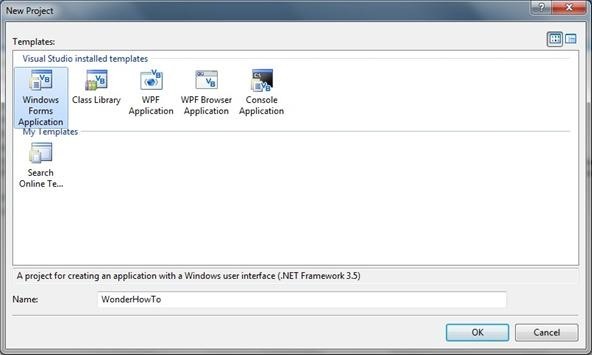 Under solution properties , need put for TARGET FRAMEWORK ".NET framework 3.5"
For net framework 4.5 , don't work . After this correction , work perfect . i am getting error while adding the code at step 4.
error message is"Error 1 A namespace does not directly contain members such as fields or methods"